Many will debate about what the best solution is, and ultimately it will depend on many factors as to how many charging units you need, and how many charge and sync units you can get away with buying. Do they need to be lockable, or is there a safe space in school where they can be locked away? Whatever the solution is, there are a plethora of units out there. My personal unit of choice is a small, unassuming, charge and sync unit from a small, UK based company called Chargebus (Link here) and in-particular the Chargebus 16 Port Desktop .In the past year, it has allowed me to charge and sync some several 1000 devices, reliably, and quietly. It’s small enough that I can take it everywhere with me (in the boot of the car) and has not failed me. I can’t recommend this highly enough. Chargebus do other charge and sync cabinets and solutions, but for me this is my preferred choice. NB: I haven’t been paid to write this review, and when I bought the unit I paid full price, but when I look back on my Twitter feed and the photos I take of setting up the iPads, it’s there in the background, working hard. My silent partner; It deserves some recognition! I also think it looks nice, alongside my Mac Book Pro! The “syncing” season is here and schools across the planet are setting up their iPads ready for the new school year. Of course just as these devices are rolled out, Apple will release iOS 7 and we’ll start all over again! Charge and Sync devices are on the whole expensive. Looking for alternatives can be a challenge. There are new smaller hubs that allow for a fast charge on one port and syncing on the other ports, but in school we need as much charge and sync as we can get. I don’t do product endorsements as such but the guys from Chargebus sent me a a very nice sync/charge unit and I genuinely do like it so here goes! Most schools buy a large syncing case on wheels, this in theory is portable as it has wheels and a handle. However, if your school is on more than one floor, getting those cases up and down stairs is miserable - believe me, I spend plenty of time moving them for workshops. With the advent of the iPad mini (which is half the weight of a standard iPad) it seems crazy to me to have them in a massive box especially if they are being moved around school. 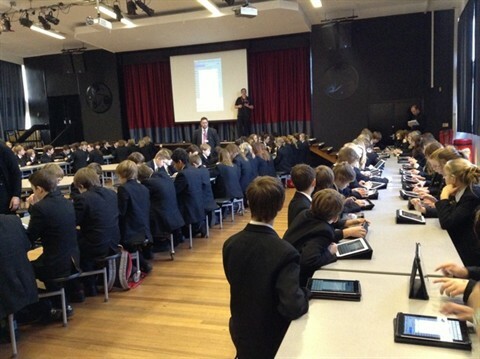 I’m not a big fan of iPads being moved from classroom to classroom see www.8iPads.com. However devices do need to be charged effectively at the end of every couple of days or day if you are a power user! So this is where a smaller charging/syncing device comes in handy. I’ve been using a 16 port Chargebus device 1600 series. This is a brick like (in a good way!) sync and charge unit. It is built with a rugged rather Apple-esque aluminium case. It also can stand upright on the desk creating an even smaller footprint. IT offices in schools (if you are lucky enough to have one) tend to be small so this is a real bonus. You use the existing cables that came with your iPads, but of course in this scenario you don’t lose them or get them trapped and damaged in the mobile sync cart. You even have to supply your own USB cable and I think a decent cable isn’t too much to ask for. The device is designed to Fast Charge any device that uses a USB connection. It is apparently the world first Universal Charge and sync unit. Apart from the power switch it has one other switch. This is labelled ACS and UCS. Apple Sync Mode as it is called and Universal Sync Mode. I’m not sure why the acronyms don’t reflect their titles, but it’s pretty obvious that the ACS setting allows for the syncing of apps and content via Apple Configurator and/or iTunes. So what’t it like to use? Well the first thing to mention is that because it sits neatly on a desk, I’m not bending down to plug cables in. I know it sounds daft but bending down to deal with carts takes it toll. My 8 iPads are just racked up on my desk and I’m good to go. Remember 16 iPad mini’s weigh the same as 8 standard iPads so sticking them in a plastic box from the pound shop is cheap and easy to move from the tech/charging room back to class. My iMac and Macbook Air both connected with ease. Apps and data moved quickly from Apple Configurator and iTunes. It can’t move the data any faster that other products this is a limitation of USB 2. There is a fan and it does get quite loud if there’s a full set of devices attached, but it does settle down and quietly sync. What I like about this device is that it is neat, robust and has tiny footprint. I don’t want to have to keep bending down to large carts full of light/small iPad minis etc. It’s not cheap a solution, but currently none of these solutions are. It comes in at about half the price of a large 16 sync/charge mobile cart . I think if you are only looking at 16-32 iPads for a small school, these will save you money and back ache!